This coming Saturday at the Lady Warrior Open, held on the campus of Midland University in Fremont Nebraska, will be a series of important Greco-Roman exhibition matches contested among a group of teams stretching across several age groups. The event, which came together in a flash over the past two weeks, is arriving during a pivotal point in the schedule for many of the wrestlers. The Senior athletes who will be competing, such as 2016 Olympian Jesse Thielke (67 kg, Legends of Gold), rising contender Cody Pack (75 kg, Legends of Gold) and the entire squad from Williams Baptist College, are using their bouts as tune-ups for the 2017 Dave Schultz Memorial, set for early November in Colorado Springs. 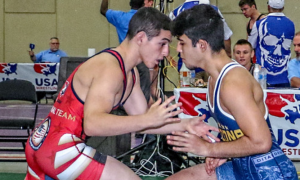 But for the younger wrestlers, Saturday’s matches likely represent the last time they will be pulling up the singlet straps for a Greco-Roman competition until the spring, a fact that makes the timing of this event all the more special. All told, an astounding 90 Greco-Roman matches are on the docket for Saturday (there will also be some freestyle) and aside from Thielke and Pack, there are plenty of other wrestlers involved who like to deliver action. The “hometown” club at the Midland Greco-Roman Exhibition, 2017 Cadet World Team co-head coach Zac Dominguez’s MWC, offers a trio of names US fans should be aware of beginning with Wesley Dawkins (61 kg). Dawkins, who attends the University of Nebraska at Kearney, checked in with a sixth-place finish at Fargo in 2016, but it was this past June when he really caught fire. At the University Nationals in Akron, Dawkins went virtually untouched en-route to gold, amassing three tech’s and a pin on the day. Not to be outdone is the tandem of Conor Knopick (55 kg) and Camden Russell (55 kg), two of Nebraska’s most decorated up-and-coming age group stars. Both athletes train at MWC and that has aided in their growth, but they also have one other variable working in their favor: overseas experience. 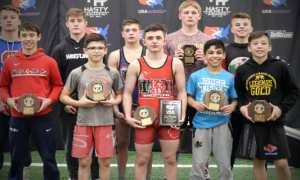 Following the UWW Cadet World Team Trials in June, Knopick and Russell were a part of the massive US delegation that went overseas to Croatia and Serbia. Russell put in an impressive silver-medal performance at the Croatia Open, the first event of the trip. The very next week, both managed to stay alive into the medal rounds at the Refik Memišević–Brale Tournament in Serbia before eventually finishing fifth. Six weeks later, Knopick joined Phillip Moomey, another Nebraska wrestler, in the finals of the Fargo Cadet Nationals where he took second to one of the nation’s most established age-groupers, Wisconsin’s Hunter Lewis. Multiple-time All American Tyler Cunningham (61 kg) is once again in the mix for MWC and is on the schedule for five matches tomorrow. Legends of Gold, located in Beresford, South Dakota, made national headlines as soon as it was announced last year that the facility would be functioning as a full-time training center. Fast-forward to this fall and the club is already stockpiling significant talent. Obviously, Thielke stands as the most accomplished competitor taking the mat on Saturday for any team, but LOG has other wrestlers to look forward to, as well. Prior to starting his Senior Greco-Roman career, Pack (son of LOG founder Terry) was a four-time NCAA Division National qualifier for South Dakota State and in 2016, barely missed out on reaching All-American status following a loss to popular Cornell star Dylan Palacio. With his college days behind him, Pack got serious about Greco immediately, placing sixth at the US Open last December and fifth at the World Team Trials earlier this spring. LOG’s other strength currently resides in its youth. Kellyn March (60 kg) came in fifth at the South Dakota Greco-Roman state tournament in 2016 and a month later placed sixth — at the Cadet Nationals. This year, March went 6-1 at the Junior Duals. Billy Sullivan (55 kg) is a three-time Nevada Greco-Roman state champion, and heavyweight Payton Smith is a two-time winner at the Northern Plains Regional. This is the story thus far for Legends of Gold, finding capable, hungry wrestlers who buy into the idea that chasing success in the international styles is the ultimate competitive objective. That is, of course, also how it goes in Blue River, Wisconsin, home to the Combat Wrestling Club. Run by 2017 Cadet World Team co-head coach Lucas Steldt, Combat, like MWC and Legends, is one of very few institutions in the country where Greco-Roman comprises a major portion of the curriculum year-round. 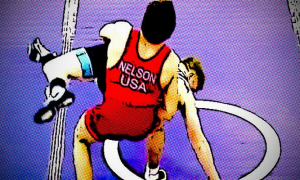 Because of this, Combat’s wrestlers possess a keen understanding of the technique and rule-set, and this often gives them a leg up on the competition. Several have experience against foreigners, primarily due to Steldt’s involvement in organizing overseas tours. 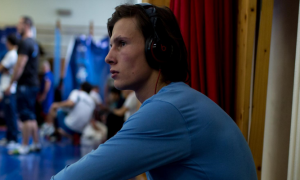 One such wrestler is Logan Hatch (66 kg), who garnered meaningful mat time in Sweden last year and has shown an eagerness for the hard contact Greco offers thanks to his physical style. Although he’s not originally from Wisconsin, prospect Delon Kanari (64 kg) will be repping Combat WC this weekend. Kanari won the Illinois state Greco title in 2017 and followed that up with an All-American performance in Fargo. He joined Steldt’s HPGT3 program in 2017 and plans on pursuing a full-time Greco-Roman career at Northern Michigan next year. Jake Drexler (70 kg) hasn’t accrued a list of accolades just yet, but he is steadily progressing in this style and should be ready to make a jump competitively as he continues to add to his arsenal. The Midland Greco-Roman Exhibition also now stands as the launch of the Williams Baptist Greco-Roman team. 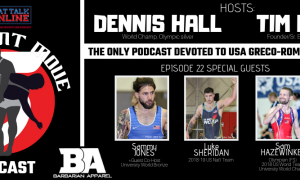 Initially, the plan was for WBC to make its debut at the upcoming Dave Schultz Memorial, but that was scrapped when Midland event organizer Cody Goessl reached out to head coach Jonathan Drendel to inquire about including his squad this weekend. So, here we are. Williams Baptist is going to be an interesting watch. 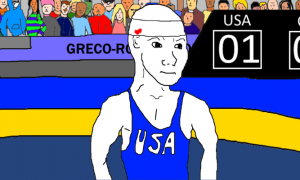 A few wrestlers on the team hold various Greco credentials that were acquired prior to enrollment, but there is also wildcard or two to watch out for. Chief among them is Ryan Whittle (77 kg), who outside of the 2017 Headlocks on the Hudson event this past summer, never wrestled an organized Greco-Roman match before in his life. Even with that, Whittle is considered to be one of Williams’ top prospects due to his overall wrestling ability and a natural feel for the style. With him is a collection of raw athletes who are making returns to Greco and one in particular should draw some attention — Chris Allen (55 kg). Allen first appeared on the national radar in 2011 when he grabbed a fourth-place finish at the Pan Ams and was a two-time Missouri state Greco champ before he went on to wrestle in college. There are other Greco state champions on Williams’ roster besides Allen. Sean Sesnan (55 kg) won three such titles in Tennessee and Pat Grigsby (67 kg) took the top spot in Missouri prior to attending Williams. 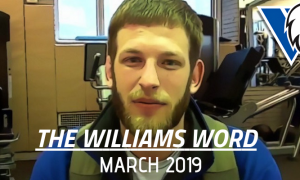 Chris Anderson (67 kg), who most will remember from his time at Northern Michigan, is now with Williams Baptist, as well, and he brings both experience and skills to the table that rival most at this event. The Details — Par terre is BACK! In an exciting twist, the officiating crew, led by Danny Blackshear and Goessl, along with the coaches for the event, have agreed to use the Midland Greco-Roman Exhibition as a testing ground for the latest version of ordered, or “forced” par terre. If you recall, United World Wrestling President Nenad Lalovic announced at a press conference during the Senior World Championships in August that par terre would be coming back to Greco-Roman, though at the time, exact guidelines had not been all the way figured out. That is no longer the case. Here is what we know: passivity is still going to be the determining factor, but there is a major exception — no more “touch start.” Instead, wrestlers taking the defensive position will go to their stomachs, the offensive wrestler will assume the top position, and the action is to begin from there. It would seem that this edition of forced par terre will lend itself very well to offensive wrestling, something the sport lacked in a big way following last year’s rule amendment. Three-minute periods will be in effect for all age levels and matches are going to be officiated just as they would at a major tournament complete with a referee, mat chairman, mat judge, and video review. The Midland Greco-Roman Exhibition Series required a lot of moving parts and cooperation in a compressed period of time just to see the light of day. But thanks to a substantial amount of eager participation as well as its unveiling of an important rule change, the event is looking more and more like a groundbreaking promotional tool for Greco-Roman in the United States at a time when the sport needs one the most. If Saturday “exhibits” anything, it is that directive.